I had the delightful task, close to this time last year, to speak–along with two of my colleagues, Carrie Peffley (Philosophy) and Chris Armstrong (Church History) to speak to the Bethel University faculty–on medieval approaches to the idea of the incarnation. My particular job, as the literature scholar in the group, was to offer a literary example. Since there’s no figure–aside from Christ himself–more closely associated with the concept of incarnation in the Middle Ages than Mary, I shared one well-known example of an entire genre of medieval poems and songs, often referred to as “Marian lyrics.” They exist in Latin as well as in most medieval European vernaculars. Like the Mystery Plays and other popular medieval works, such lyrics often involve what one might call an “incarnational logic”: the idea is to go for the most relatable kind of human factor in biblical stories and theological ideas, to find an opening whereby our experiences as flesh-and-blood, everyday human beings can, properly directed, become points of access to more transcendent truths. It is important to remember, speaking of the incarnation, that the root word of the term “incarnation” is the Latin carnis. Meat. So to be incarnated is not only to be “made man” in later humanistic sense of Hamlet’s “what a piece of work is man,” much less in the sense of a Cartesian cogito, but rather to be made meat: real flesh and bone and sinew and organ. Real human experience, one that includes as much transcendent reason as it does stubbed toes and post-nasal drip. Just as God had to become incarnate–en-meat-ed–in order to become reconciled with humankind, the medieval mind recognized that those of us who start out as meat and walk around as sacks of it, to understand that very act, have to work the other direction, and try to understand the divine through our own embodiedness. Mary provided a strong instance of that kind of embodied access-point to the incarnation through her very special relationship to it: while medieval Christians believed that all have access, by grace, to the incarnate God, they also strenuously acknowledged that she was the only one who literally gave birth to him (and if you don’t think that creates a special relationship, ask anyone who’s gone through labor). They were also acutely aware that she was the only one who, having given that birth, had to look on as her child was mercilessly tortured, her knowledge of the spiritual significance of what was happening in no way diminishing her shock and grief at the agonizing death of her son. I sometimes hear present-day, protestant Christians speak uneasily about the medieval veneration on Mary, as though too much attention to her might amount to giving her a kind of worship that should only be given to God. But as the lyric I’m about to share shows, the medieval interest in Mary–and the kind of interest that I think it might be illuminating and helpful for modern Protestants to recover–stems from precisely her lack of divinity, and her unique participation in the event of the incarnation as a fully human, and in no way divine, being. It is precisely her humanity that makes her a point of access to the more difficult concept of the incarnate Christ. For medieval she thus becomes not an object of worship in herself, but a special access point to an understanding of the sacrifice of her son. The poem I’d like to share to demonstrate this concept is a 13th century Latin lyric, most commonly known as the Stabat Mater. It’s part of a whole sub-genre of Marian lyrics that dwell on the image of Mary at the foot of the cross. This is a kind of move very typical of a popular medieval theological imagination: That imagination, as I’ve said, looks for the most human element in Biblical story, the one an audience of regular people can best relate to. Most of the translations I’ve encountered online seem to be geared primarily toward creating texts for singing, and for that reason concentrate on preserving the meter and rhyme of the Latin original. While I by no means consider myself an expert Latinist, the text below is my own attempt at a translation that focuses on preserving, specifically, the very embodied sense of Mary’s experience that the poem channels. while her son hung down. the agony of her glorious child. Notice that what the poem already begins to do, here, is access the event of the crucifixion not from the perspective of the mystery of the God/Man, but through something to which we regular humans might have a much easier time relating. After all, none of us can claim to know what it might feel like to die as the incarnate Christ–but we know what it’s like to grieve. We know what it feels like in the pits of our stomachs to lose someone, to watch a loved one suffer. The poem leads us into that impossible experience of the suffering Christ through the more familiar experience of the grieving parent. The image of Mary at the foot of the cross brings readers to experience the incarnation by means of the most broken parts of our own souls, the parts that still ache from our own losses of husbands, wives, sisters, brothers, and friends. Truly, O blessed Mother, a sword has pierced your heart. For only by passing through your heart could the sword enter the flesh of your son. Indeed, after your Jesus, who belongs to everyone–but is especially yours–gave up his life, the cruel spear, which was not withheld from his lifeless body, tore open his side. Clearly it did not touch his soul and could not harm him, but it did pierce your heart. For surely his soul was no longer there, but yours could not be torn away. This the violence of sorrow has cut through your heart, and we rightly call you more than martyr, since the effect of compassion in you has gone beyond the endurance of physical suffering. Bernard here makes an incredible observation about Mary’s relationship to this moment in the crucifixion: when the sword pierced Christ’s side, he was past the point of being hurt by it. But Mary wasn’t. So the sword that gives proof of his bodily humanity, in that sense, passed through her–the mom who had to watch it happen–before it passed through him. She felt the pain of it in a way he did not. Notice that for Bernard, too, Mary is not simply special because of her personal grief, but because of her compassion, and the compassion of which he speaks is not her compassion for her suffering son, although that’s there, but rather her compassion for us: she, more than any other human being, gave up the most to allow the reconciliation of God and humankind to happen. She watched her son die horribly, suffering even past his physical pain, sacrificing her own grief for her son to the knowledge of what his death would mean for the rest of humanity. so I might be pleasing to Him. who deigned to suffer for me. P.S. 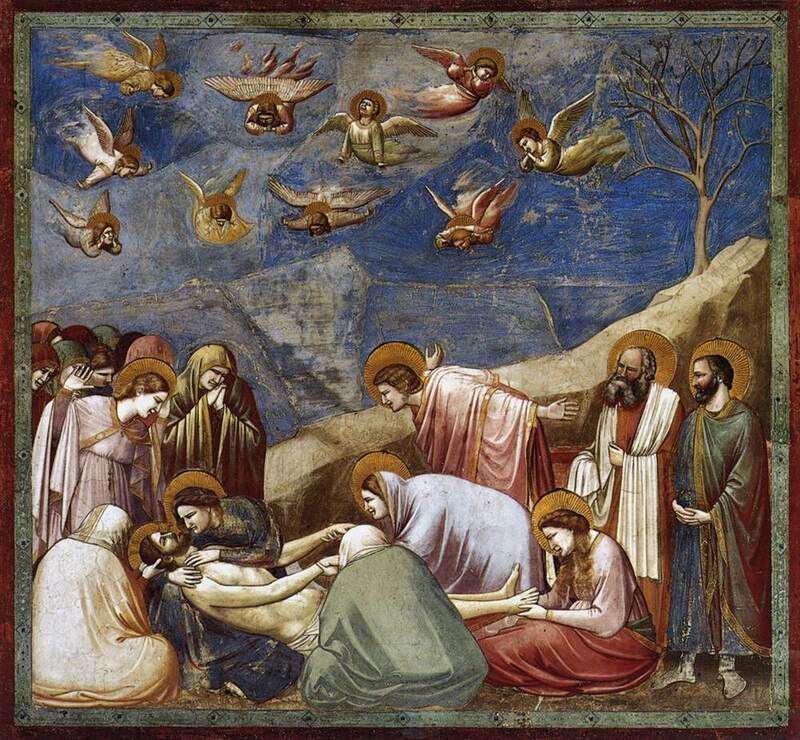 If you find this interesting, be sure to check out the much more complete thoughts on the medieval concept of the incarnation by the redoubtable Chris Armstrong, at his blog Grateful to the Dead. See http://www.catholic.org/clife/lent/story.php?id=34430 for a text of Bernard’s complete homily.